According to press reports – denied by both sides – the Saudis have quietly assured the Israelis that no action will be taken against Israeli aircraft flying through Saudi airspace on their way to strike Iranian nuclear research and development facilities. The Kingdom of Saudi Arabia, an Islamic theocracy, cooperating with the Jewish State of Israel against a fellow Islamic nation? It would probably make a good novel - the premise is not that far-fetched. Saudi Arabia, as well as virtually every country in the region except possibly Syria, does not want Iran to possess nuclear weapons. That capability would not only drastically alter the fragile balance of power among the two major players bordering the Persian Gulf, but would likely start a nuclear arms race among other regional powers. Iran already has missiles that can strike anywhere in the Middle East and continues to develop a longer range capability. If Iran acquires nuclear weapons to complement its missile inventory, it is hard to believe that Saudi Arabia, Egypt and Turkey would not seek to acquire nuclear weapons of their own. Egypt at one time had an active nuclear research effort, Saudi Arabia in the past had sought to purchase (like they do most advanced capabilities) nuclear weapons from Pakistan, and Turkish nuclear ambitions remain a mystery. Of course, the best outcome would be for Iran to abandon its nuclear weapons program. I think it is safe to say that most analysts have concluded that the purpose of the Iranian nuclear program is not for the generation of electricity. If Iran used every declared nuclear facility it has to generate power, it would still be less than the wasted energy produced from their oil and gas wells flares. Iran is not going to abandon its program. The Iranian regime means to have a nuclear weapons capability - they believe it is the only guarantor of their own aspirations. They see themselves as the principal power broker in the region. Personal note: An Islamic Revolutionary Guard Corps officer once told me that the Persians were the smartest of God's people, and that the body of water was called the "Persian" Gulf for a reason. Unfettered access to Saudi airspace would greatly increase the chances for a successful Israeli strike on Iranian nuclear facilities. Without that access, the most likely route of attack would be through a minimum of Saudi airspace, moving as soon as possible into Iraqi airspace (controlled by American forces). That adds distance to a direct route - Israeli aircraft will be operating at the extreme limits of their combat radius. See my earlier article, "Iran - Israel's Air Strike Options Update." 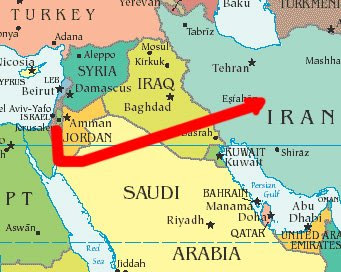 However, if the Israelis are assured of no Saudi intervention, they can remain over Saudi airspace for a longer period of time to fly a direct route to their targets in Iran (see map), crossing into Iraqi airspace a bit later. If they chose this route and extend their time in Saudi airspace, they will certainly be detected by Saudi Arabia's fairly modern ground and air-based radar systems. If the Israelis have been able to convince the Saudis to look the other way, why not the Jordanians as well? They have no interest in Iran developing a nuclear weapons capability. The parts of Jordan and Saudi Arabia that Israeli jets would overfly are sparsely populated and not the subject of intense surveillance. Both countries could claim ignorance. I am not sure what to make of Vice President Biden's remarks, interpreted by some as giving Israel tacit approval to launch a military strike against Iran. This comes at a time when President Obama is trying to "engage" the Iranian leadership despite its ongoing trampling of human rights in the wake of the recent presidential election. Likewise, President Obama convinced the leaders at the G8 summit in Italy not to impose tougher sanctions on Iran, while at the same time his Secretary of State threatened that the United States would do just that. There are a lot of mixed signals in the air right now. So who knows what is going on between the Israelis and Saudis? If there is an Israeli strike against Iran, all the Arab and Muslim countries will condemn Israel in public. Most will also smile in private.